Time to start using up some of my stash of designer papers! These are from Stampin’ Up! I used the Nestabilities Fleur de Lis Rectangle to make the second layer of this card. Then I added some bling from Zva Creative. They have such a wonderful selection of rhinestones and pearls in so many beautiful shapes! Then, I added a punched flower made with the 5 Flower XL Punch from SU, with a center rhinestone and popped up the sentiment by adding strips of Scor-Tape on each end and flexing the paper in the center. This card is made with a 5 1/2″ square cardbase in SU’s Always Artichoke, the Designer Paper is also from SU (retired), and the sentiment is stamped in Always Artichoke on a scrap of SU River Rock. 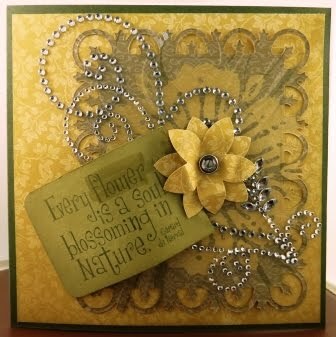 For emphasis on the word “flower” in the sentiment it’s been colored with a River Rock Stampin’ Write marker.